Table-top views of some of the Apollo 17 Lunar Surface Experiment equipment. Included are the Geophone Module and Cable Reels of the Lunar Seismic Profiling Experiment (S-203), a component of the Apollo Lunar Surface Experiments Package which will be carried on the Apollo 17 lunar landing mission. 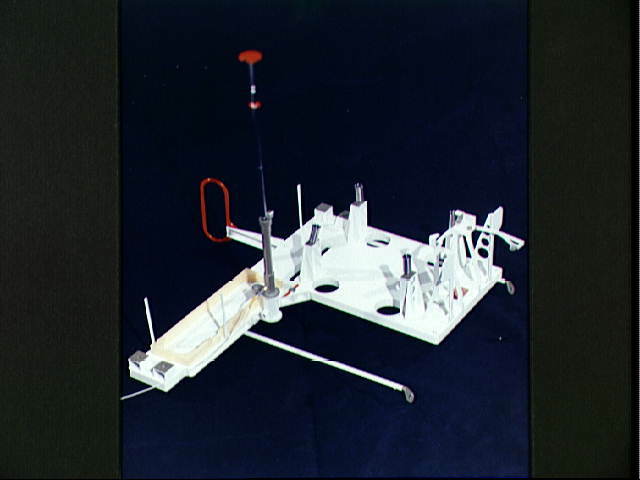 After it is triggered, the experiment will settle down into a passive listening mode, detecting Moonquakes, meteorite impacts and the thump caused by the Lunar Module ascent stage impact (37259); The remote antenna for the Lunar Seismic Profiling Experiment (S-203) (37260).